What is the Travel Promotion Act? "Ski Utah - The Greatest Snow on Earth!" is a rallying cry for skiers the world over, and Utah boasts a number of world-famous ski resorts. Rent a timeshare and plan a week of fun in the snow for the entire family! The town of Park City, 36 miles from Salt Lake City, (the 2002 host of the Winter Olympics), is known for its three major ski resorts: Park City, Deer Valley and The Canyons. The town is also home to the United States Ski Team and is the location of Robert Redford's famed Sundance Film Festival. Well known for its premiere ski trails Park City Mountain Resort also has an unprecedented children's program. Called the "Kid's Signature Programs" the Signature 5 ski class is for children aged 6 to 14. Signature 3 is geared specifically for the younger set, aged 3 1/2 to 5, and combines ski instruction with other fun activities such as crafts, a huge jungle gym, and storybook time. Located in Provo Canyon an hour drive from Salt Lake City and just 45 minutes from Park City is Sundance, created by Robert Redford. Ranked second in the country by Conde Nast Traveler's 2007 Readers' Poll for the Top 50 U.S. Mainland Resorts, Sundance offers a wonderfully diverse winter experience. Besides 42 alpine ski runs, the resort also features night skiing, snowboarding and cross-country skiing. Off-slope fun includes classes at the Art Shack on jewelry making, pottery and painting. Find Park City timeshare resorts. 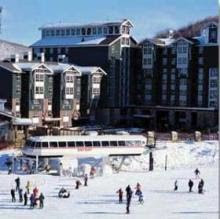 Photo shown is Marriott’s Mountain Side at Park City Resort. There are a lot of inexpensive timeshares for rent around Park City, so a trip here can be very budget-friendly. Also the Sundance Film Festival is so fun - don't miss that! You mentioned the kid's program at the Park City Mountain Resort, and I have to second that. The people who ran the program were the best I'd ever seen with our children.